I was extremely excited to make these delicious parfaits. I was truly amazed at how delectable they are. You can change up the dried fruits or nuts and make it your own. This parfait is to-die-for, melt in your mouth goodness! Grease and line 3 (11x17) inch pans with wax paper, set aside. In a large mixing bowl combine, oats, apricots, craisins, almonds, wheat germ and cinnamon. Blend together with hands. In a 1 quart pot combine, agave nectar, canola oil and coconut oil. Turn burner to low heat and once it is hot, add pot and cook while stirring for 4 minutes until coconut oil has melted. Remove pot from burner and pour over dry mixture. Stir together until completely incorporated. Pour mixture onto 1 of the pans. Bake at 325 degrees on the 3rd rack for 22 minutes, tossing mixture with a spatula every 4 minutes. Remove from oven and toss mixture onto the other 2 pans to dry out. 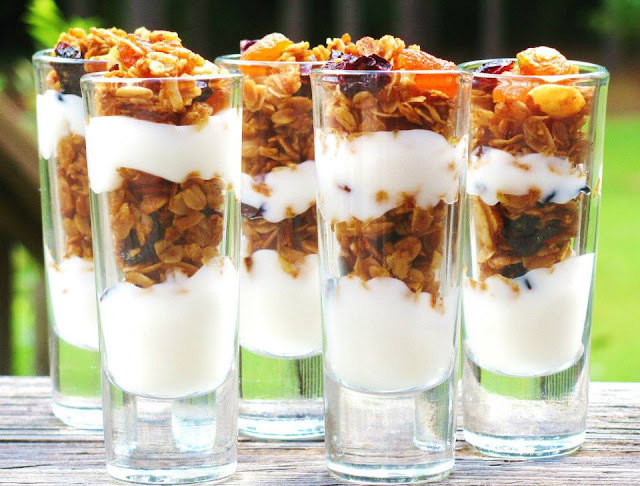 Layer yogurt in the bottom of parfait glasses and then add a layer of granola. Repeat until glasses are filled.